Most successful companies come from humble beginnings, and the history of Lobar, Inc. is no different. Lloyd Eichelberger had established himself as a skilled carpenter in the Harrisburg, Pennsylvania area, but his entrepreneurial spirit and desire to provide a better life for his wife Barbara and his family led him to starting his own construction business. Lloyd and Barbara decided to take the leap of faith and established their own in 1967 as commercial building contractors. Aptly named Lobar (Lo from Lloyd and bar from Barbara), the company began its journey of becoming one of the largest and most respected building contractors and general construction firms in Pennsylvania. Lloyd and Barbara’s work ethic was simple; conduct business with the utmost amount of integrity and honesty, provide a quality product at a fair price, and treat all of the company’s employees as if they were family. Today, Lobar, Inc. has grown into a multi-million-dollar enterprise, providing construction services for the public sector at the local, state, and federal levels and employment to over 300 individuals. Lobar is still owned and operated by the Eichelberger family, which now consists of 1st, 2nd and 3rd generation family members. The values instilled by Lloyd and Barbara are still evident, as Lobar has been recognized numerous times as the “General Contractor of the Year” by the American Subcontractors Association and as one of the “50 Best Places to Work in PA” by their employees. Since its founding in 1967, Lobar, Inc. has been offering the broadest range of construction services, which reflects the company’s understanding of the needs of today’s value-minded clients. 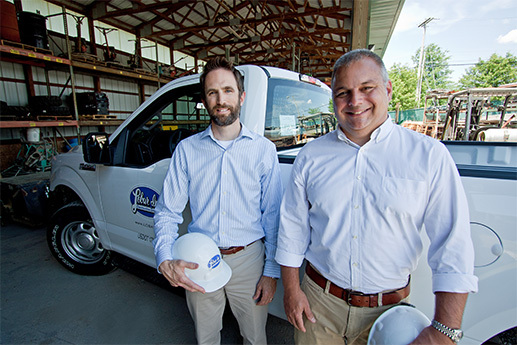 As third-generation owners and builders, Lobar is one of the few private, Pennsylvania-based family owned general contracting firms operating statewide. Over the past forty years, Lobar has built its reputation in the fields of education, commercial, industrial, government, correctional, and design build. Today, Lobar has become a multi-million-dollar enterprise, and offers comprehensive, quality construction services for Pennsylvania, New York, Maryland, West Virginia, and Virginia. This five-decade commitment to exceeding client expectations has made Lobar, Inc. a leader in the construction industry, as evidenced by our selection in 1996, 2002, 2004, and 2006 as the American Subcontractor Association’s General Contractor of the Year. Lobar has expanded from its corporate offices in South Central PA, with satellite offices in the Williamsport (Northern Tier) and Allentown (Lehigh Valley) areas. These offices allow us to better serve our customers as we continuously expand our geographical work area. award by Ernst and Young. Voted "General Contractor of the Year" by the American Subcontractors Association. Established a third office location for our eastern PA operations. I have worked with several contractors on different projects in the last 25 years, and find this construction team to be one of the best. They are efficient, work hard to keep the project in line and are excellent in communication. This is a great experience for me to work with such a professional group! From day #1 Lobar and their employees showed total dedication to our project. They seemed to understand the importance of our project and what it meant to us, as well as the compressed time frame from the project was scheduled to be completed in.